The violence is mounting, with 37 murders in the town on the first weekend of December alone. The dead included four children, as well as three policemen, who were among nine decapitations. As a result of the death toll, an army officer has replaced the police chief, Jesus Capella. The army has increasingly been taking over the roles of civil authorities, which have been hit by high-profile corruption scandals. Sr Capella had been subject to numerous death threats. The gangs often target the police for intimidation or corruption. 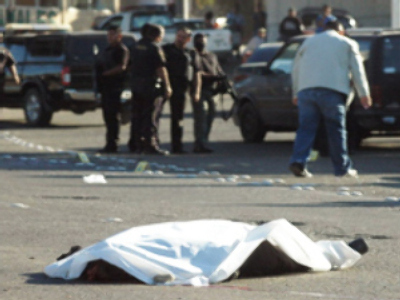 Rosarito police deputy, Jesus Maria Elizaldo was found shot on the road to Tijuana last week. He was the eighth policeman to be killed in the state of Baja California in less than two months, according to local media reports. The border states of Baja California and Chihuahua have seen 60% of the killings. Under pressure from an aggressive government policy to destroy the cartels, the gangs are fighting for the remaining critical routes into the USA. The success of President Felipe Calderon's strategy remains in doubt despite 40,000 troops which have been brought in to fight the cartels. The immediate result has been a rising death toll, with 943 deaths in November making it the worst month on record, while the annual toll has doubled this year to nearly 5,400. 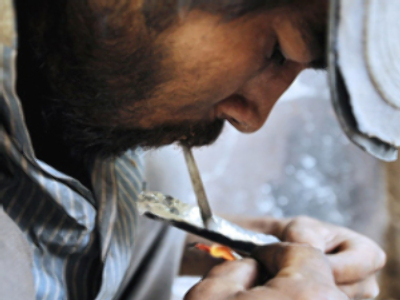 Mexico has become the epicenter of drugs violence, with its problems spreading beyond the border and into Guatemala. Late on Sunday, 1st December, a drunken battle was fought between Mexican and Guatemalan traffickers over the Guatemalan border. Seventeen were killed in the violence in the town of Santa Ana Huista. The fight, which began over a bet on a horse race, was fought with high-powered weaponry. The police retrieved an M-16 assault rifle and grenade launchers after the battle. The dead included Guatemalans and Mexicans, as well as vehicles registered in Mexico. “We are studying the arrival of many Mexicans, specifically members of the Zeta group, who want to come, to take advantage of Guatemalan territory,” said Marlene Blanco Lapola, chief of the National Civil Police (PNC), referring to a narcotics-trafficking group. Guatemala has been hit by rising levels of violence between groups of traffickers. Its location makes it a crucial staging post for smuggling cocaine from Colombia into Mexico and the United States. “Several cartels here that are operating in Guatemalan territory already have certain alliances with Mexican cartels,” said Blanco. 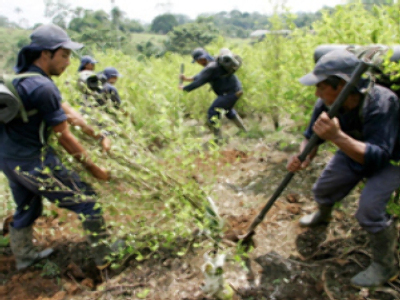 Guatemala's poor infrastructure and lack of resources make it particularly vulnerable to the influence of drugs cartels. The PNC only has 22 officers in the area where the killings took place, making it easy for the heavily armed groups from both sides of the border to operate. All predictions are for the violence to intensify and spread further into 2009.